Speaking of being mesmerized by music upon its first hearing at the movie theater, this one really really got me. I actually cried just for the sake of the music. The rest of the movie...eh, but still, you get the idea. Who knew a handful of years later I would interview Gary Oldman's body double from this film? 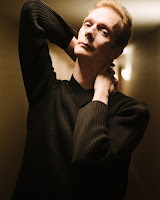 (Doug Jones.) But isn't it incredible? Then again, I've always had a soft spot for opera. Some songs in particular push this invisible button I have marked "cry instantly" when I hear them, it's the weirdest thing. Especially this, even though I know it's cliche of me. Right from the 2:10 mark on, to quote Scrooged, "Niagara Falls". That made me all teary...quick, I need to recover. Here, it's still opera centric. It's a little montage from the Marx Brothers', "A Night At The Opera". Another one of my ALL TIME FAVES!